At Mariposa Veterinary Wellness Center, we know animals are not just pets, they are family. If this is something that you feel strongly about as well, then you likely want to do everything you can in order to keep your pets safe during the holiday season. Chilly seasonal temperatures in Lenexa can affect your pet, especially smaller animals or those that spend a lot of time outside. Meanwhile, a bored dog or cat can chew on houseplants, decorations, and seasonal foods that are not healthy to be consumed. Use these tips to ensure that you are always keeping their safety at the top of your priority list. 1. Don’t Give Them Table Scraps – Most pet owners love to share our food with our furry friends, but one thing that a lot of people do not consider is that not all people food is good for them. Beyond that, there is an added choking hazard if you have foods that have small bones in them. To be on the safe side, you should refrain from giving any of your pets table food and let guests know that tables scraps should not be given to pets, especially during the holidays. 2. Dress Them Up to Keep Them Warm – If pets are going to be spending time outside in the cold weather, especially if there is snow, you should consider putting some type of pet jacket or sweater on them to help keep them warm. There are lots of options to keep them warm so make sure you have something available when the temperatures start dropping. 3. Don’t Leave Them Outside in the Cold – Even if you have outside pets, you should try to create a space for them to come inside during the cold Lenexa nights so they can sleep in the warmth. It starts to get even colder once the sun goes down and if the temperatures are below freezing, you do not want to keep them out in that weather. Some alternatives to this include allowing them to come inside for the night, creating a space for them in your garage, or other types of sheltered spaces to provide heat. 4. Protect Them From Heat Sources – Cats and dogs love to get up close to sources of heat, especially during the winter months. Unfortunately, this can also be a hazard to them if you do not take the time to protect them from it. If they are there for too long, they could end up getting burned by the source of the heat. Before you turn the heat on, you should try to block off these sources. Some to consider include a hot water heater or a furnace. Making these places inaccessible is the best course of action. 5. Adjust Food Intake Based on Activity – Some pets may be more active during the winter, especially if they love the snow. Others may be a bit more lethargic during the winter. During this time, you should consider adjusting how much food you give them based on how much time they are spending active. Consider if there is a change because of the weather and adjust as needed, if there is a change at all. 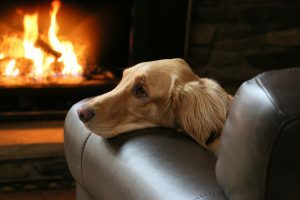 You want to do everything you can to keep your pets safe and healthy during the winter months. Even some things that may seem harmless can cause an issue, which is why it is important to take these tips into account. Stay safe and happy holidays from all of us at Mariposa Veterinary Wellness Center!